With his new Swan Lake for Royal Ballet being such a resounding success earlier this year, the chance to see the work of choreographer Liam Scarlett is a welcome one indeed. 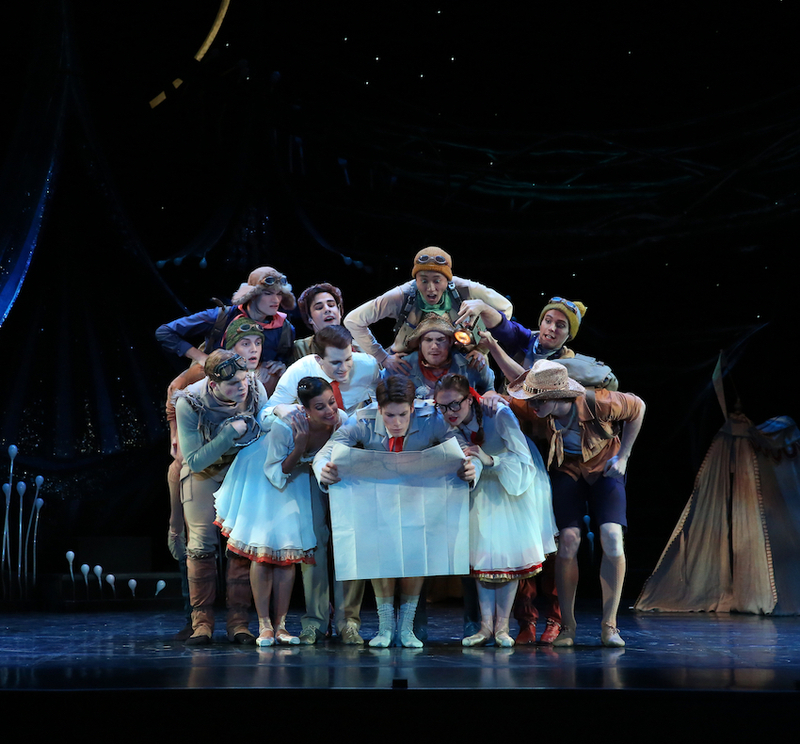 Aware of the heritage of Frederick Ashton’s The Dream, Scarlett retains the Mendelssohn score and the neatly reduced set of characters but places more emphasis on lively, characterful comedy in a fancifully magical setting. Designer Tracy Grant Lord has crafted a dazzling mystical setting of swirling vines and enchanted woodland huts, overseen by Oberon, who stands overhead in a giant circular moon. The stage of Her Majesty’s Theatre may look a little cramped, but the end result is just more magic per square metre. The midsummer night brings out a sky full of stars, and lighting designer Kendall Smith gives the scenery a special sparkle and glow against the night sky. Lord has clearly collaborated closely with Scarlett in designing the spectacular costumes. High on individuality, the costumes connect to Scarlett’s vision of lively character-based humour. The four lovers are cast as mannered explorers, supported by a quirky team of rustics, each dressed wittily in hiking chic. Wearing fluffy tufted tutus, the corps fairies sport luscious midnight blue, with the four featured fairies each in their own candy coloured shade. Queensland Ballet’s Music Director Nigel Gaynor has arranged Mendelssohn’s lovely music for the new full-length ballet, and conducts Orchestra Victoria for the Melbourne season. Chiefly using light playing from the strings, the music has a driving sense of sustained tension, which perfectly supports the fleeting stage action. Wonderful use is made of brass for the very funny pas de deux between Titania and donkey-headed Bottom, and of course the glorious Wedding March heralds the happiest of endings. Supporting his crystal clear storytelling, Scarlett creates a distinctive dance vocabulary for each set of characters, from the formal, noble royals Oberon and Titania to the fun-loving, spritely fairies and from the polite young British lovers to the enthusiastically exuberant rustics. Puck’s nimble, spirited dance is enhanced by the mischievous grin that never leaves his face. 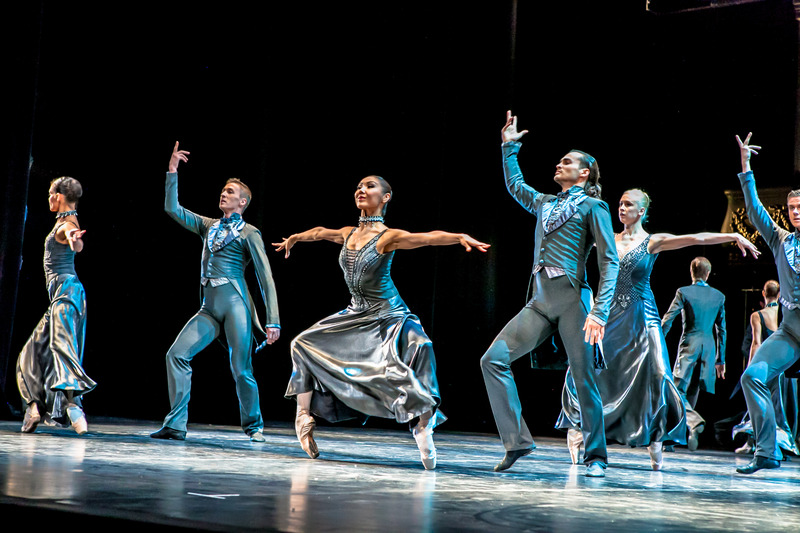 Scarlett’s choreography is clearly grounded in classical ballet, yet there are touches of modern dance that liven the work with added freshness. 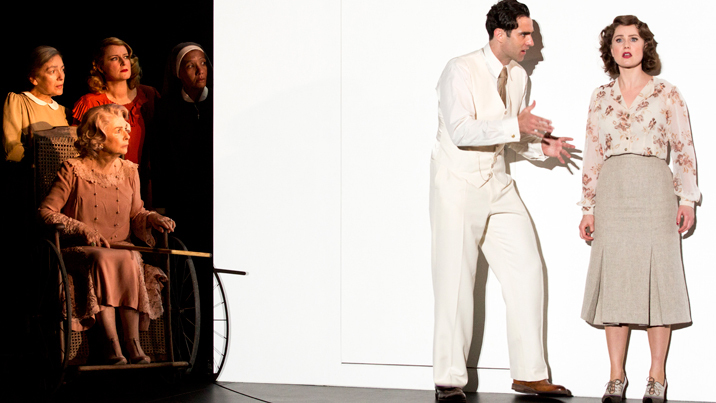 The rustics, in particular, feature the sort of individual characterisation usually seen in Matthew Bourne’s work. Of the four lovers, Helena is an especial delight; bedecked in pigtails and spectacles, her surprise at suddenly having two men in ardent amorous pursuit is deliciously funny. Principal Artists Laura Hidalgo and Victor Estévez led the opening night cast with dignity and strength. Projecting a regal bearing that successfully conveyed maturity and privilege, the pair complemented each other with crisp, sharp lines. While Titania and Oberon’s grand pas de deuxmisses a touch of the excitement of the climax of a love story, it is nonetheless a chance to enjoy virtuosic dance. Kohei Iwamoto was a clear audience favourite as cheeky spirit Puck, dancing with sprightly athletic agility and projecting an adorable character. 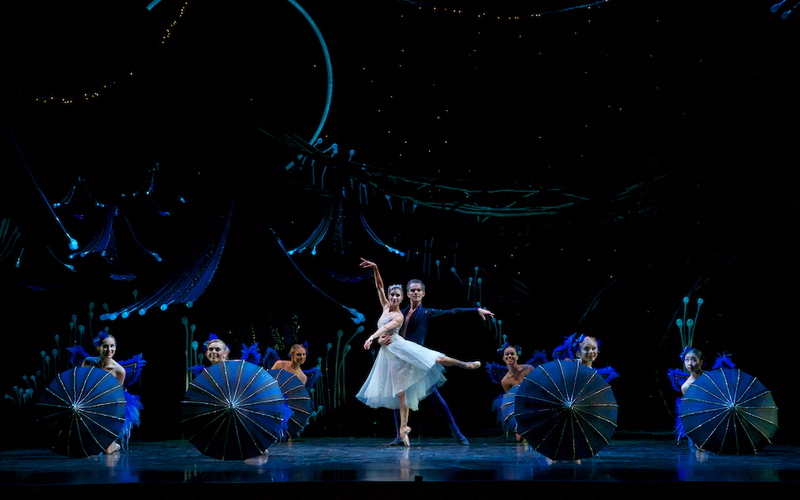 Puck’s joy when fairy Mustard Seed blesses him with a kiss is just one of the ballet’s delightful moments. Georgia Swan’s unapologetically nerdy Helena contrasts perfectly with Yanela Piñera’s refined Hermia. 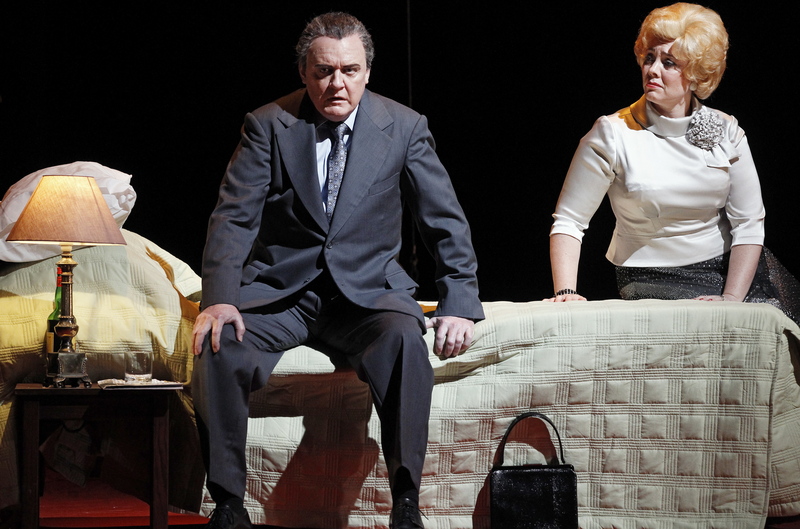 Likewise, Joel Woellner gives Lysander the manners of a young gentleman while Alexander Idaszak brings a more extroverted energy to Demetrius. The quartet carry the humour of the key plot points with flair, their performances so engaging that the quality of their dancing is almost taken for granted. Rian Thompson pulls off the canny trick of changing his dance style for Bottom before and after his donkey transformation. Where Bottom is lethargic and clumsy, the donkey is frisky and nimble, with very impressive high kicks. As mischievous Mustard Seed, Mia Heathcote’s vibrant stage persona helps her to stand out amongst the four fairies. 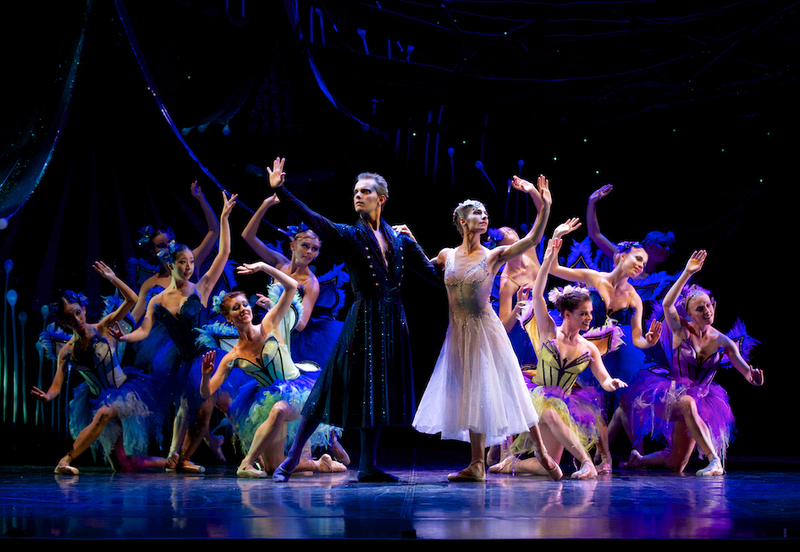 With The Australian Ballet’s Melbourne offerings for 2018 at an end, Queensland Ballet’s A Midsummer Night’s Dream is ideal family entertainment. A perfect introduction to ballet, the design, dance, music and humour make A Midsummer Night’s Dream the complete entertainment package. A Midsummer Night’s Dreamplays at Her Majesty’s Theatre, Melbourne until 7 October 2018. Read the Melbourne A Midsummer Night’s Dreamcasting list. Read the Melbourne A Midsummer Night’s Dream program.